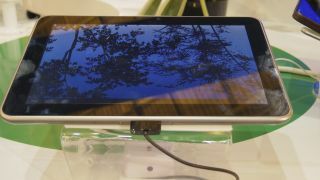 ZTE decided there aren't quite enough Android tablet competitors and has added another option to the fray. But does the ZTE V96 differentiate itself? We had our first taste of the V96 in Barcelona at MWC, but this was our first chance to really get hands-on with the device. What we found was a fairly run of the mill 10.1-inch tablet with a resolution of 1280x800. The PPI isn't going to wow anyone, but it wasn't particularly painful to look at. Like every Android tablet worth its salt, 4.0 ICS is pre-installed. The ZTE also packs 1GB of RAM, HSPA+, AT&T's LTE, 5MP rear-facing camera and a 2MP front facer. There's a MicroSD slot and full-sized SIM slot on the top edge of the device. So then there's the processor, an impressive and speedy Qualcomme 1.7GHZ dual-core Krait processor. The thing isn't exactly light and we found the plastic back of the device to be a bit creaky for our liking. There was also (confusingly) an aluminum-backed version, but ZTE didn't say which were being prepped for which regions. Another baffling addition is that the V96 on the show floor uses a 30-pin dock connector to charge. It's possible it was slightly tweaked, but it looks identical to any 30-pin we've ever seen connected to an iPod or iPad. There's currently still no word on release date or price point, but expect us to let you know as soon as we find out anything.